At least 500 U.S. military deaths in Iraq and Afghanistan were directly linked to Iran and its support for anti-American militants — a newly disclosed statistic that offers grim context for the Obama administration's diplomatic deal with the Iranian regime aimed at curtailing the rogue nation's nuclear ambitions. That figure underscores the controversy surrounding Washington's deal with Tehran, a long-sought goal for the president — but one that is fiercely opposed by many Republicans in Congress and other critics. Many of those estimated 500 deaths occurred during the so-called surge in Iraq, when President George W. Bush ordered an influx of tens of thousands of troops to confront what had devolved into a sectarian civil war. Scores of American personnel were killed or maimed by highly lethal bombs, known as explosively formed penetrators, or EFPs, that Iran manufactured and supplied to Shiite militias across the border in Iraq. Many EFPs were powerful enough to destroy U.S. Humvees and breach tank hulls. The startling number emerged last week as Sen. Tom Cotton, an Arkansas Republican and Army veteran who served as an infantry officer in Iraq and Afghanistan, pressed the issue at a confirmation hearing for Marine Corps Gen. Joseph Dunford, who is Obama's nominee to be chairman of the Joint Chiefs of Staff. The Defense Department does not specifically track casualties linked to Iran. The 500 estimate is a ballpark figure based on intelligence assessments, according to a Pentagon official familiar with Dunford's remarks. The memory of those deaths was surely a factor in the caution signaled by the Pentagon on Tuesday afternoon, after Obama's announcement of this landmark deal between Iran, the U.S. and five other countries. "As we implement this historic agreement, deterrence remains a major component of America's national security," Defense Secretary Ash Carter said in a statement. The U.S. military will remain ready to "check Iranian malign influence" and "utilize the military option if necessary," he added. The Iranian-made EFPs first appeared in Iraq in 2005 and for years were the most lethal weapon that American troops faced during the eight-year Iraq war. Unlike the typical improvised explosive devices that U.S. troops encountered there, the EFPs used more sophisticated technology and required more skilled milling to produce. Also known as "shaped" explosives, they used curved copper plates to direct or "shape" the bomb blast. The estimate of 500 American deaths is probably on the low side, said David "Bo" Bolgiano, a retired Army Special Forces officer who deployed to Iraq in 2006 and 2007 with the Joint Improvised Explosive Device Defeat Organization, an organization created by the Pentagon to rapidly address the number of casualties inflicted by roadside bombs and other IEDs. 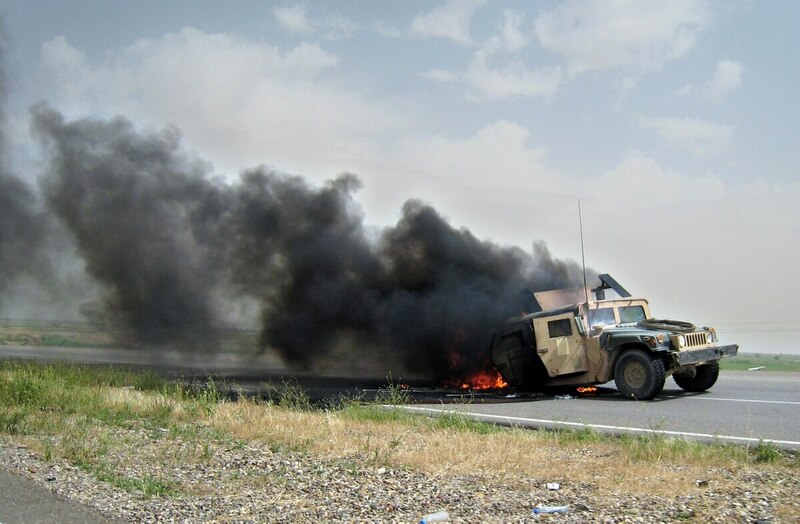 "It's very difficult to quantify because, when you have an IED explosion that occurs in theater, you'd have to connect the dots and say, 'Wwell, we have three U.S. casualties tied to that IED,' and then that IED is tied to a specific copper-plated EFP from Iran. Often times, those forensics are missing," Bolgiano said in an interview. "The big EFPs from Iran were fairly easy to identify because of the metallurgy involved and the copper plate formation," he said. "We had beyond-a-reasonable-doubt proof that Iran was the main supplier of the copper-plate EFPs," said Bolgiano. Troops referred to them as "IEDs," but that's not completely accurate, Bolgiano said. "Improvised is a little bit misleading because it makes it sound like a basement bomb-maker, and that was not the case. The shaped charges, the copper plates, the components were anything but unsophisticated. They were designed and at the level anything that any other non-Western government would have," Bolgiano said. 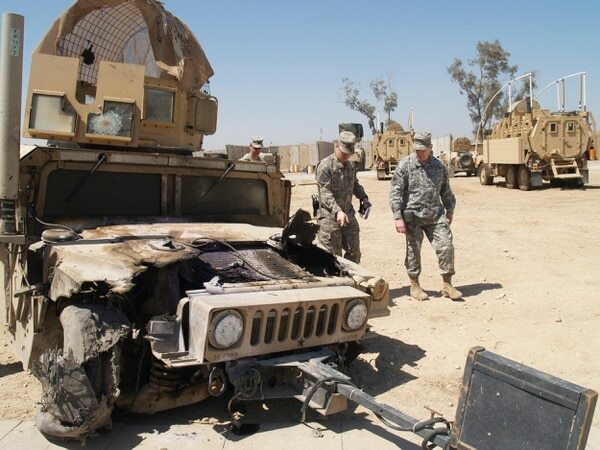 U.S. soldiers inspect a humvee damaged in 2009 by an improvised explosive in Iraq. Cotton contends that number is much greater than 500, with still more American troops wounded in action as a result of Iran's influence on U.S. adversaries in both war zones. A spokeswoman for the senator, Caroline Rabbit, said Tuesday that Iran "has the blood of hundreds of Americans on its hands and this deal only gives them billions of dollars to continue killing Americans." She was unable to provide Military Times with a more-detailed breakdown of those statistics, nor was the Pentagon. American troops pulled out of Iraq in 2011 only to and returned last year as the Islamic State group overran Iraqi forces in places U.S. troops fought and died to liberate. In the eyes of many Iraq War veterans, to include some senior U.S. military officials, the Iraqi Shiite militias with links to Iran also have American blood on their hands. In March, the top U.S. commander in the Middle East said he hoped the strategy for defeating Islamic State extremists will not involve an alliance with those groups. "Three tours in Iraq commanding troops who were brutalized by some of these Shia militias ... I will not — and I hope we never — coordinate or cooperate with the Shia militias," Army Gen. Lloyd Austin, chief of U.S. Central Command, told the Senate Armed Services Committee last winter. But after the demoralizing fall of the city of Ramadi in May, the U.S. military shifted its policy. Now, U.S. warplanes are launching airstrikes in support of some Shiite militias fighting the Islamic State under the command and control of the Iraqi government. Dunford, who pending confirmation will become only the second Marine ever to serve as the U.S. military's top officer, referred to Iran as a "malign force," telling lawmakers that, despite a nuclear agreement, Iran will continue to exert its influence across the Middle East. One need look no farther than the Red Sea, where this past spring American naval vessels moved to block an Iranian arms shipment bound for rebel forces fighting the American-backed government in Yemen. "If confirmed as the chairman," Dunford said, "I'll make sure that our leadership has a full range of military options to deal with Iranian activity." In a statement, Cotton indicated he believes the deal with Iran is a mistake, principally because it comes with an infusion of "tens of billions of dollars to finance its sponsorship of terrorism against the United States and our allies." "When I was a platoon leader in Iraq, my soldiers and I faced deadly roadside bombs, made and supplied by Iran," the statement reads. "I tried to reassure them, but I could only tell them to hope it wasn't our day to die by Iran's roadside bombs. If Iran obtains a nuclear weapon, I fear the United States will only be able to hope it isn't our day to die by an Iranian nuclear bomb."